← Are you interesting in getting more involved in UNISON? Are you LGBT? Picket and donate: support the NSL strike! Our low-paid members on the NSL parking enforcement contract have been taking strike action for a decent pay increase from early September. Here is how you can support the workers. The background to the dispute is here. These low paid members (currently earning £8.92 per hour) will of course not be paid during their industrial action, so we need to raise hardship funds. Please donate what you can to help this group of workers. If you currently work for the Council, bear in mind that the pay of outsourced workers is of vital importance, as privatisation is only necessary if it can be used to cut wages, so if outsourced workers can win decent pay it lowers the risk of privatisation for the rest of us. Or you can send us a cheque, payable to “Camden Unison” to our address in the below left hand corner of this page. 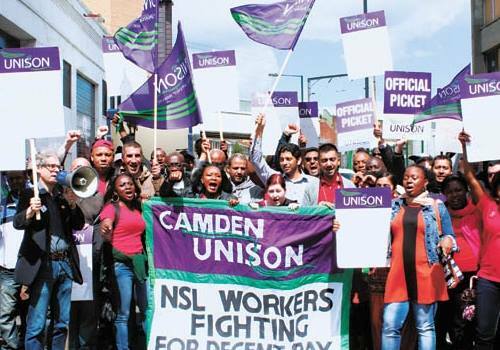 Like the I Support Camden NSL workers Facebook page here, or follow us on Twitter: @CamdenCEOs. Sign our petition in support of NSL workers here. Regis Road, NW5 3EW- Car Pound & CEO Base, nearest Tube: Kentish Town. This entry was posted in Uncategorized and tagged NSL, pay, strikes. Bookmark the permalink.